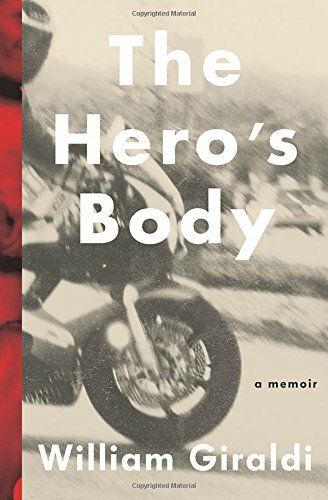 A memoir of motorcycles and muscles, of obsession and grief, and of a young man who learned how to stay alive through literature. Giraldi writes with subtlety about the unsubtle world of clanging metal, exploring with frank tenderness the ways men form friendships and how those friendships can grow into love ... Giraldi has written a powerful and sympathetic accounting of the lengths men will go to discover themselves through the workings of their fragile and complicated bodies, and the ways they discover hidden strength. The Hero’s Body contains beauty, solace, humor, a whole reference library. Giraldi ends with a coda about becoming a father to two sons. Where his father is concerned, it’s not our reading but his own living—and by this I mean his own living through grief—that still seems paramount. Giraldi does some of his best writing when calling out the reader’s impulse to see the oiled men and women on the pages of Flex magazine as freaks tampering with nature ... there isn’t a sentence in The Hero’s Body that lacks vigor or limps onto the page. His prose is sonorously throttled like a twin-barrel exhaust...it’s also here that the memoir begins to grind. The revved up language and etymological inquiries feel like an overcompensation, a writer consciously pausing to flex some linguistic muscle, and the pace of the narrative slows considerably. What did you think of The Hero's Body?